This goes down as one of the weirdest things I’ve ever made. So, appropriate for Halloween? Maybe? It started as my annual “this is what I’m gonna make for the Wildwood Park Harvest Fest culinary competition,” which also becomes the annual “I’m too exhausted to enter the event, so I’ll just make the dish I had planned at home, a week or two later.” This year’s Harvest Fest ingredient was apples, and by golly, I wasn’t going to make just any old sweet dessert-type-thing. After a few ideas of my own followed up with a bit of research, here’s what I ended up with. The hubs and big kid dug in, but neither were enthusiastic about finishing. It was a little too weird: Not sweet enough, not savory enough… something. But when said pie sat in the fridge overnight, something magical happened. The flavors melded. The texture improved. While I’ll still tweak a few things next time, this is now a pie worth eating. I think. 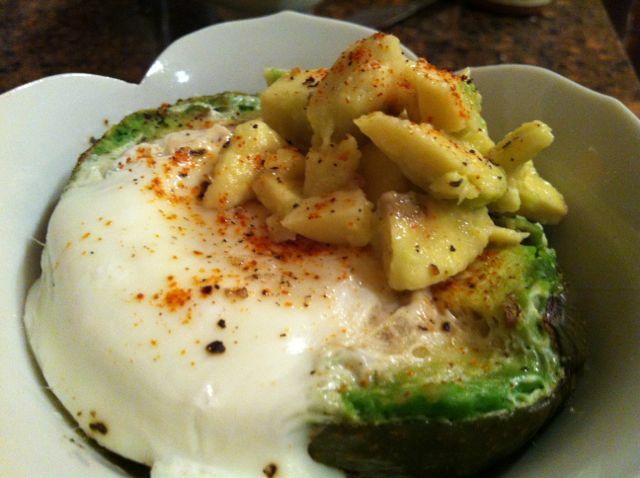 The recipe below includes a few of those added tweaks, such as a glaze and a little more seasoning. I’m still not sure if it’s a winner, but it’s definitely worth a shot, if you’re brave. I actually like it. 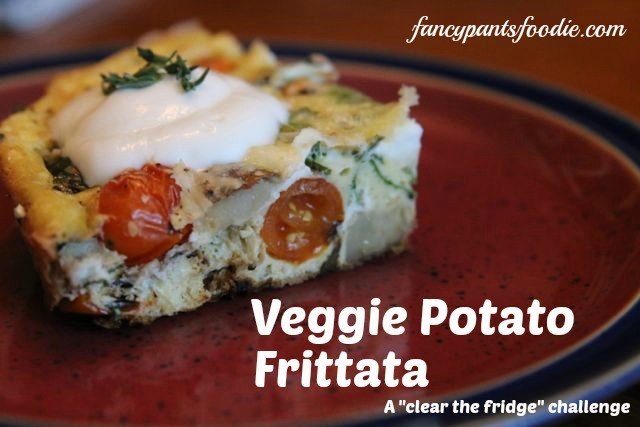 Just keep it in the fridge overnight, will ya? 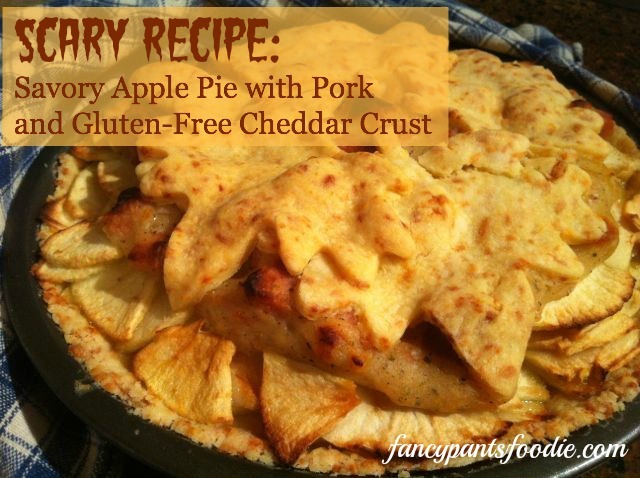 The crust can be made with regular, all-purpose flour if nobody in your family requires gluten-free. I tried a new GF blend, Gluten Free Pantry, with good results. Mix the flour and salt in a medium bowl, then stir in the cheese until thoroughly combined. Cut the butter into the mixture with a pastry cutter until you get a sandy-looking mixture. Sprinkle in the water, one tablespoon at a time, mixing with your hand until the dough just holds together. You may not need all the water. Press half the mixture into a 9-inch pie plate, working up the sides. (If you absolutely must roll it out old-school, be my guest, but this recipe works fine pressed in.) On a floured surface, roll the remainder into a disc to cover the entire top, or a flat piece for cutting out shapes. (I did this on a small flexible cutting mat that could be easily moved to the fridge.) Place both the pie plate and top into the fridge for now. Place your diced pork loin and oil into a hot pot (I used my Dutch oven, but anything largish will work) and stir a couple minutes to sear. Turn down the heat to medium and add the yellow onion and salt. Cook another couple minutes to soften the onions, stirring occasionally. Add the cup of apple cider, sage, whole allspice and bay leaf, bring to a simmer, reduce the heat and cover. Cook this over low heat for 20 to 30 minutes, or until the pork is tender. Remove the allspice and the bay leaf. In a small bowl, mix the 3 T. flour and milk until well combined. Watch for lumps! (The pie pictured used a 1/4 c. flour and less milk and was way too thick.) Stir this slurry slowly (say that five times fast) into the pork mixture and simmer, stirring, until it’s just thickened up. Peel and slice the apples very thinly. I used a Pampered Chef apple corer/slicer/peeler (I know, chefs, don’t judge me!) with good results. If you go this route, cut your resulting spirals at least in half, maybe quarters so they’ll come apart. 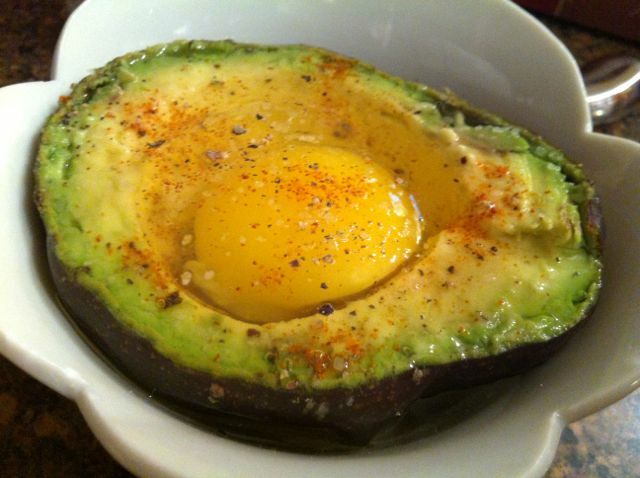 Sprinkle with lemon juice or Fruit Fresh if you do this a bit ahead. I did this while the pork was simmering in the cider. Remove the pie plate with bottom crust from the fridge. Place half the pork mixture in the crust. On top of that, place all the apples, sprinkling with sugar as you go to evenly distribute it. And over the apples, place the last of the pork mixture, spreading it evenly across the top. Place the remaining crust over the top and shape as desired, with vents or designs, or cut several shapes to place over the top. While the pie is in the oven, reduce the 1/2 c. apple cider in a small saucepan until just thickened, and cool slightly. Bake at 450 degrees for 10 minutes, then reduce the temperature to 350 and bake for another 30 minutes. When there are 10 minutes left, remove the pie from the oven, brush on the cider glaze using a pastry brush, and return to the oven for the final 10 minutes or until the crust is finished and browned. For some reason, last Friday morning, I was a ravenous beast. When I got to what shall be called Second Breakfast, I remembered the little baked potato that I didn’t eat from the night before. There it sat, still intact, in the fridge. I remembered that pre-baked, chilled potatoes make marvelous fries. I’d heard that, anyway. Something to do with the structure of the starches. Here’s what I did, and you can do the same. In yo face in five minutes or less! Heat 4T. olive oil in a small nonstick skillet. Slice the chilled potato into 1/2″ rounds. When the oil is hot, salt and pepper one side of the rounds and sprinkle with your choice of herb. (I was super lazy and hungry and just used my favorite Italian blend.) Place the seasoned sides of the potato down into the oil, not overcrowding the pan, and then season the top sides. When the bottoms are browned to your liking, turn them over with tongs. 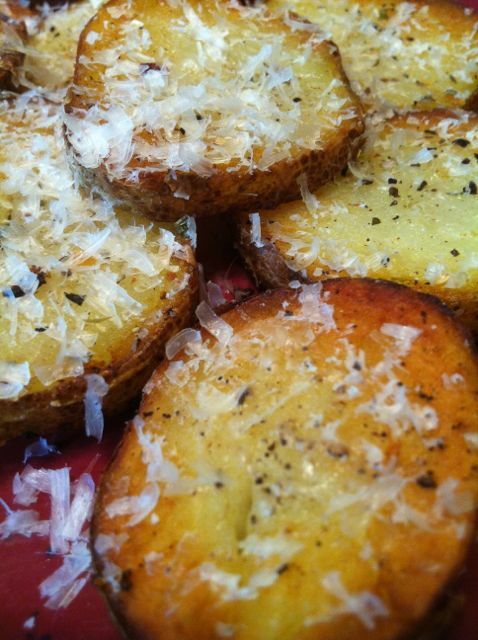 While the second side is browning, grate some parmesan onto the rounds, as much as you like. You may have to do this in two batches; if so, add more oil as needed for the second batch. Remove from pan, ingest, enjoy! Posts this week will be part of Arkansas Women Blogger’s BLOGtober Fest challenge. I usually don’t blog daily unless there are a lot of events going on, so don’t freak out if you get posts by email! Click the pumpkin badge on the right side of the page for related (or not) posts from bloggers across Arkansas. A few days back, I had the opportunity to go to the Ben E. Keith food show in Hot Springs. It was my first time to attend, and I came ready — with a cooler in my car. I had heard that, if you hang out long enough, they start giving away food at the end of the show, because they can’t sell it after it’s been on display. I did not go home disappointed. Long story short, my haul included some rhubarb, one of those things I’ve always wanted to try but never got around to it. Its timeliness in early summer corresponds just right with strawberry season, which probably explains why they go together so often. Having been gluten-free for several months now, I contemplated a pie, but the crust issue made me tired. It’s possible, even fairly foolproof with the new Cup4Cup flour I’ve discovered, but…it was a long week. I needed something to demonstrate at my daughter’s 4th grade classroom. It has become tradition in recent years for me to do this, in full chef coat regalia, during the last week of school to allow the teacher an hour or two to finish up paperwork. 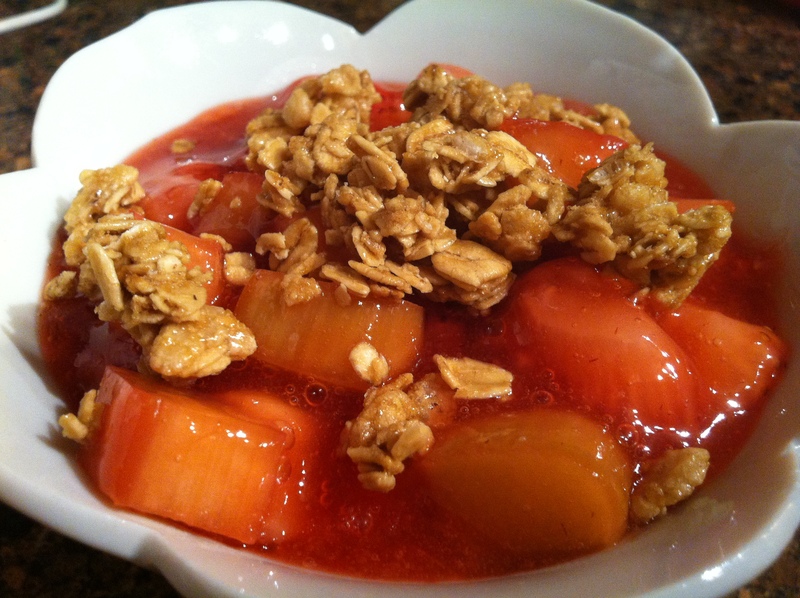 The night before, it hit me: a strawberry rhubarb crisp, with granola on top. 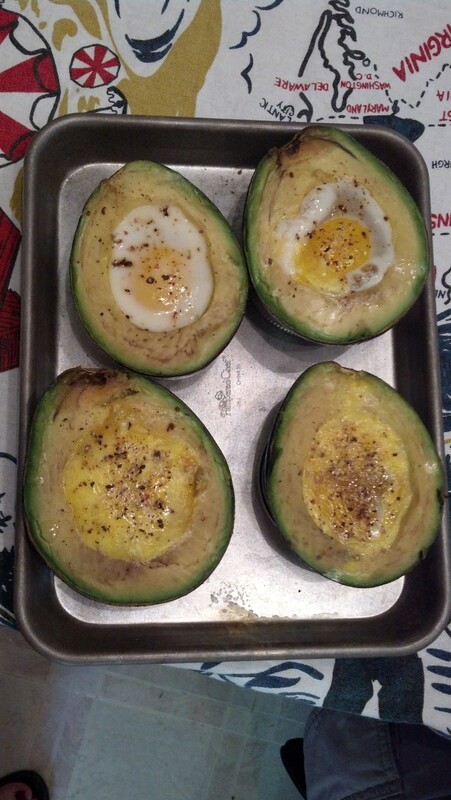 What a great idea to carry over for summer breakfasts! So, around midnight before the demo, here I am, cooking up this stuff. It’s traditionally done with tapioca pearls, which honestly kinda gross me out, but my gluten-free pantry offered the solution of tapioca flour. I ended up slightly overdoing it for something to be eaten out of a bowl, but it would stay together quite nicely in a pie crust this way. I think, next time, I’ll just use one tablespoon of the flour unless it’s going in a pie proper. So, don’t be afraid to try this with the kids this summer. Make a big batch, buy a box of granola cereal (read the labels to make sure it’s not full of junk; Cascadian Farms Organic is good and inexpensive), and eat it for breakfast all week! Without turning on the heat, put the washed and cut fruits into a medium saucepan with the sugars and gently stir. If you have time, cover the pan and let it macerate for 30 minutes. Place the saucepan over medium heat to bring the mixture to a simmer (honestly, just fat-sounding bubbles if there’s not much liquid yet), then reduce to low heat. Stir with a folding motion fairly frequently until the fruit is soft and the strawberries are almost completely broken down, or just to the level of chunkiness you desire. Add the vanilla, balsamic vinegar and salt, and gently stir. Add the tapioca flour and mix thoroughly, using less if the mixture is to be used as a crisp and more if as a pie. Heat through for another 5 minutes, to cook the starch well, then remove from the heat. Taste and adjust sweetness or tartness (you may add more balsamic or some lemon juice if you like). 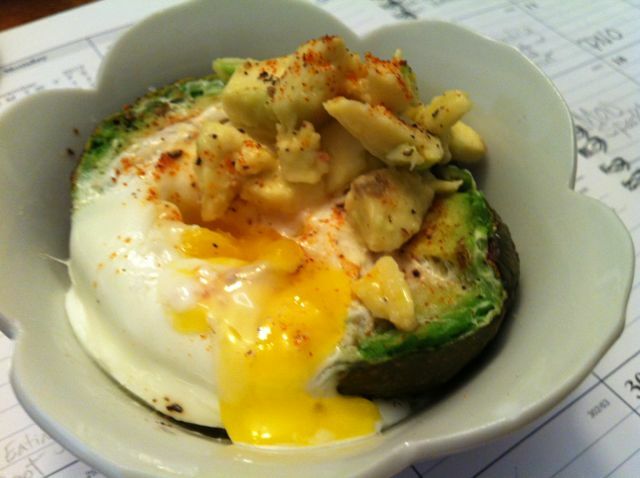 If using as a crisp, place some of the filling in a bowl and sprinkle the cereal on top. If using as a pie, place in a bottom crust, cover with the top, cut vents (or use a super-cool pie bird) and bake as directed in the crust recipe. Of all the snow-day kid memories I might have, waffles just isn’t one of them. Not to say my awesome stay-at-home mom neglected her snowly duties; we made Mickey Mouse pancakes, built snowmen out of laundry baskets and otherwise enjoyed our time freed from school routines. But things will be different for my kids, I tell you. There’s just something about waffles. Crispy, chewy, and always game for add-ins. And don’t you dare let me catch you using pancake batter! 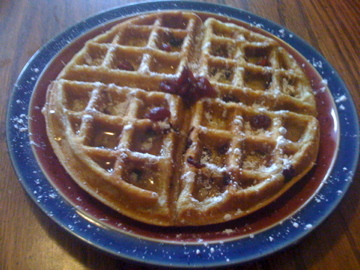 The above waffles were one result of our Snowpocalypse 2010 cooking frenzy. More dishes will appear in future posts, I promise. The base recipe is from (I know, him again) Alton Brown on Good Eats. I swear I’m not obsessed. He just knows his stuff. I’ve tweaked a few things to make it uniquely mine, but I’m giving him some props. In a medium bowl whisk (yes, dry whisk, it works great) together the flours, soda, baking powder, salt, cinnamon, and turbinado sugar. 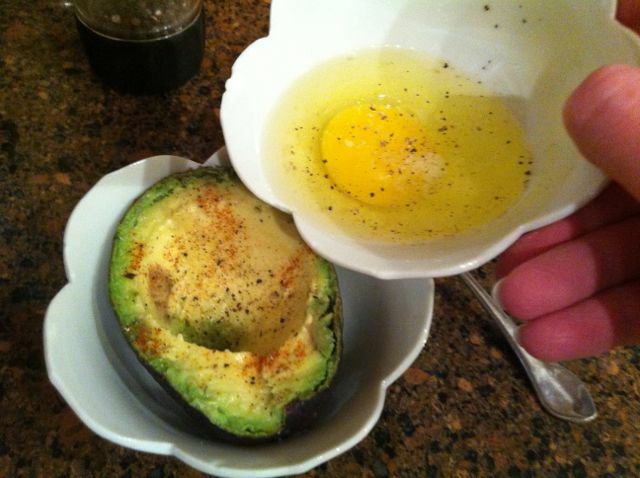 In another bowl beat together the eggs and melted butter (not too hot, or you’ll cook the eggs! ), and then add the buttermilk. Add the wet ingredients to the dry and stir until combined. Don’t overmix, but just until you don’t see any more raw flour. Allow the mixture to rest for 5 minutes so the flour can absorb liquids. Meanwhile, heat up your favorite waffle maker. I’ve found that price is often a good indicator of quality, so do your research and don’t cheap out too much. Unless you just get a free one from Gevalia, which we did, and works too. It’s better than the $20 one I bought at Target. Cranberried and sugar sprinkled, ready to go. 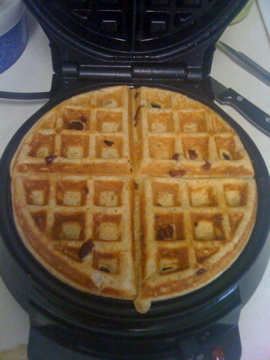 Spray the waffle maker with vegetable spray, then ladle in the amount directed by your waffle maker. (This is important…too little or too much won’t get a good product.) Now the fun part — sprinkle in some dried cranberries, chocolate chips or both. Then sprinkle some more turbinado sugar over the whole thing, to create a little crunch on top. Close the machine and cook for the amount of time your machine states. For serving, sprinkle more cranberries and/or chips on top, drizzle with maple syrup (the real stuff, please), and dust with powdered sugar. Voila. Deliciousness. Don’t be afraid. It really is yummy. Today is my mom’s birthday. By the way, did you know that October 5 is the U.S.’ most common birthday? One would logically surmise this is because of New Year’s Eve. Hmmmm. Anyway, mom didn’t want a super-sweet cake, so I decided to make something seasonal and just sorta sweet. Started reading through various cookbooks’ versions of pumpkin bread, pumpkin cake, pumpkin muffins. Muffins seemed my best bet, but the recipes were making me yawn. So, I put on my Fancy Pants hat and got creative. Hence the following recipe. Whenever I cook with my daughter, I tell her that, whenever possible, to use a “secret” or “surprise” ingredient, something nobody would try on their own, or are hard pressed to pick out exactly what “that something” might be. She was at school today while I made the muffins, but I think she would have gone the same direction. Preheat oven to 400 degrees. If using fresh, cooked pumpkin, strain puree for at least 30 minutes in cheesecloth or a wire sieve. In a standing mixer, cream the butter at medium-high speed until soft and lightened in color. Add molasses and 1 1/2 c. of the brown sugar, beating until combined and light in texture. Add the eggs, pumpkin and carrot, and mix on medium speed until blended. In a separate bowl or on a flexible cutting board, sift together the flour, salt, baking soda, cinnamon and nutmeg. Pour into wet ingredients and gently fold together, being careful not to overmix. 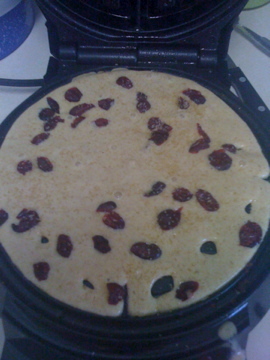 Fold in the cranberries, raisins or currants. Using a spoon or large disher (what I used), fill muffin cups three-quarters full. Place three almond slivers in the middle of each muffin top, pointing up slightly in a radiating pattern. (If using walnut or pecan halves, place one at an upward angle in the middle of each muffin. If using pieces, sprinkle a small amount on each muffin.) Sprinkle muffins with remaining 1/4 c. brown sugar and with cayenne to taste. Bake for 12 – 15 minutes. In my original batch, I only put the cayenne on three of the muffins, as an experiment. I should have done them all! 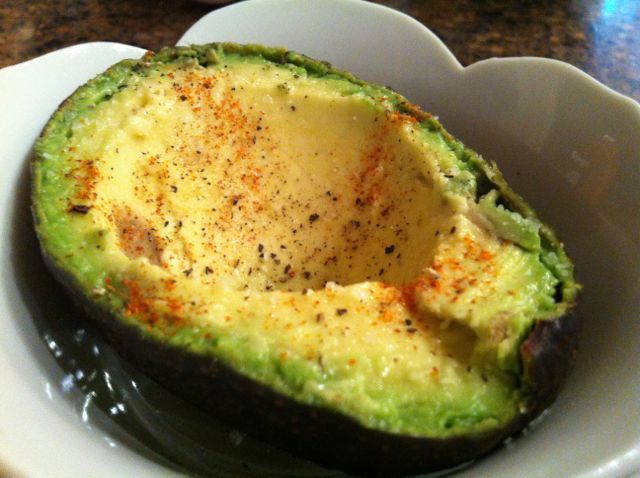 Well, kids probably wouldn’t like it, so maybe you could go half-and-half. And in case you didn’t see my earlier tweets, they get two “noms” up! They smell incredible, aren’t too sweet, and have a great depth of flavor, even without the cayenne. The carrot puree keeps the whole thing moist. And you don’t have to tell anyone it’s baby food, or even that it has carrots at all. Maybe next time I’ll come up with a lower-fat version with applesauce rather than the butter. We’ll see. Let me know if you try it…these are great! P.S. Things are shaping up for the Argenta Fall Foodie Fest on October 17. After the Susan G. Komen Race for the Cure, mosey on over to 6th and Main Streets, North Little Rock to put some calories back in. You’ll have the chance to buy yummy plates from some of central Arkansas’ best chefs, made with local autumn produce. More soon.